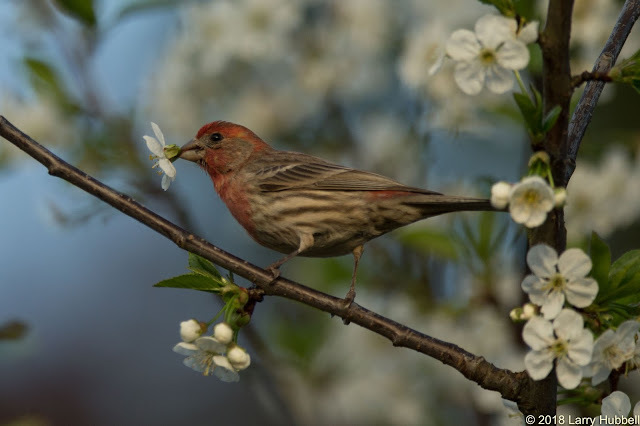 Last year my friends Anne and Rick Matsen invited me to come and take photos of blossom-twirling birds, which return to their backyard on an annual basis. A few weeks ago the timing finally came together. 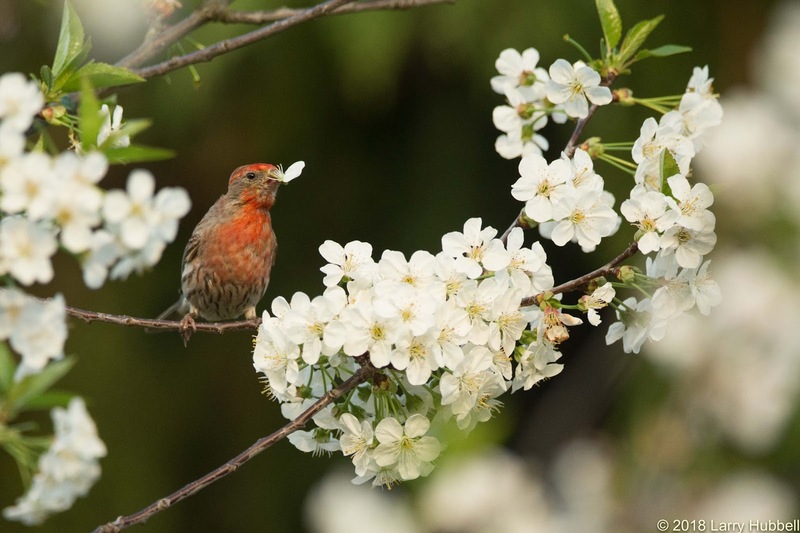 The hungry House Finch, the Cherry Blossoms and the evening sunlight all appeared at the same time. The experience was a first for me. I had never seen anything like it. 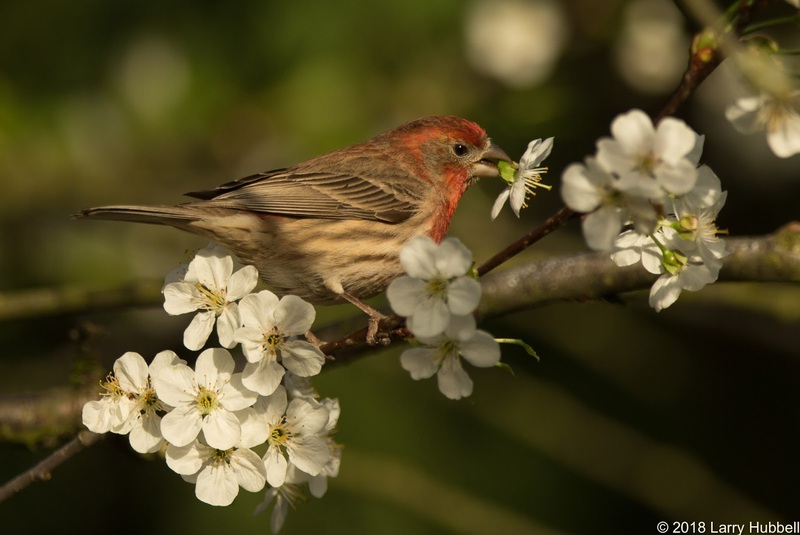 The finches plucked the blossoms off the tree and manipulated them with their beaks. 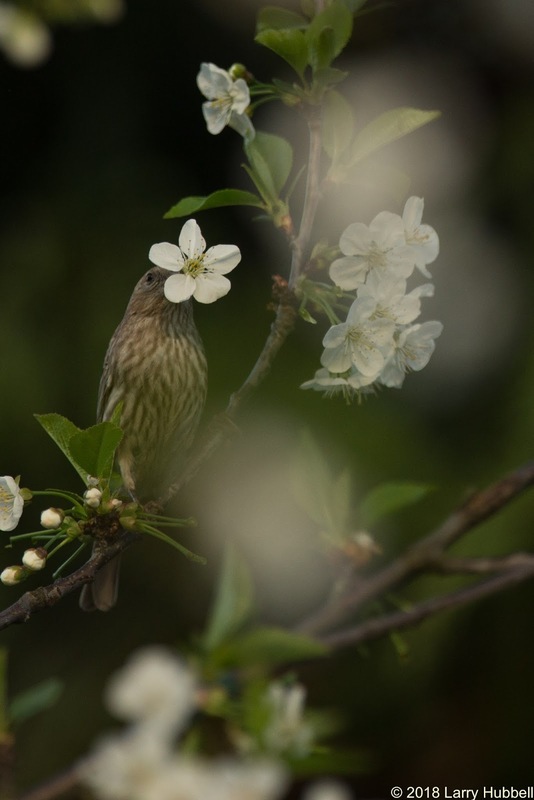 I would not have been surprised to find the birds eating cherries off the tree later in the year, but consuming the green partially-developed buds, while hiding behind the blossoms seemed odd. 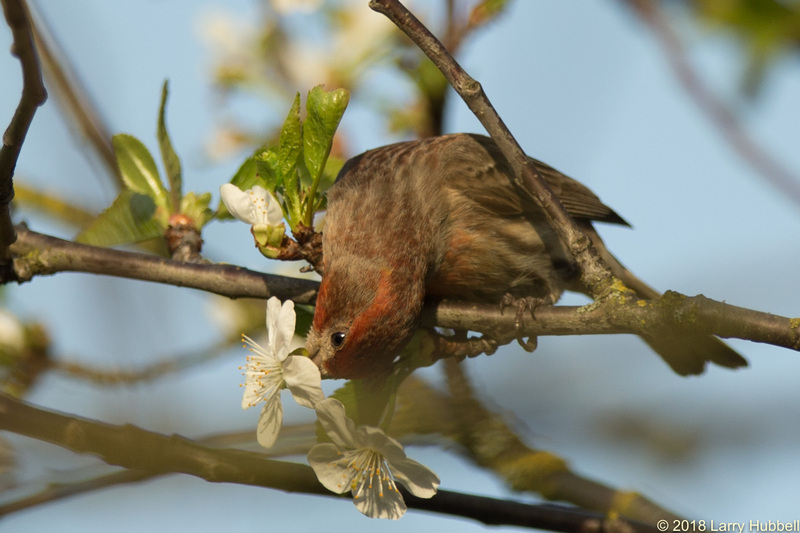 Apparently, when the blossoms burst into full bloom, the buds reach a particularly tasty state. I am thinking there may be sugar in the buds, created in the process of producing nectar to attract pollinators. 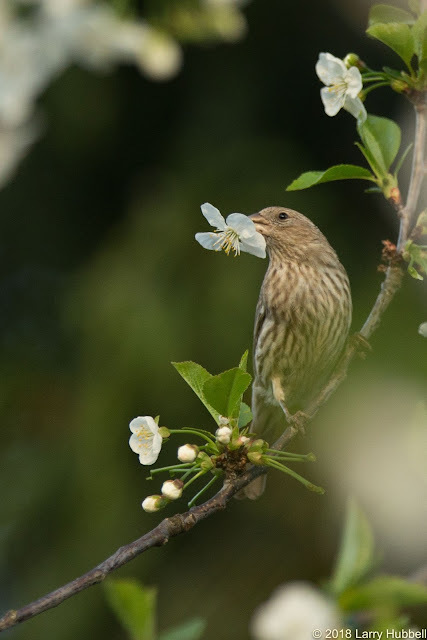 I doubt that the finches are actually helping with the pollination, however professional cherry growers usually 'thin' their cherries to increase the size of the surviving fruit. Possibly, the House Finch intervention actually increases the volume of fruit which the tree produces. As the finch work to secure their feast, the petals flutter slowly to the ground. I suspect Anne and Rick simply enjoy the spectacle without regard for the production of fruit. The process reminds me of snowfall, without the need for long underwear. 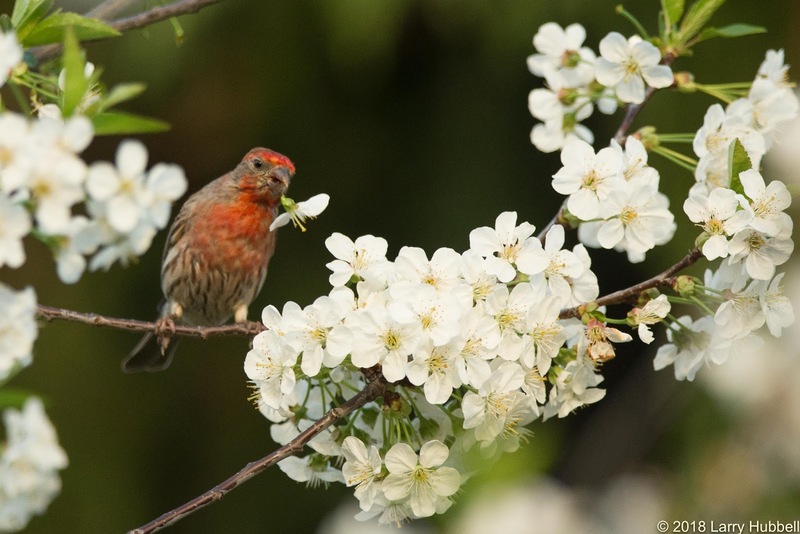 The beauty of nature in action seems like a fitting Mother's Day gift. This post is dedicated to both my mother and my wife. Without their consistent love and care neither I, nor my children would be here today. 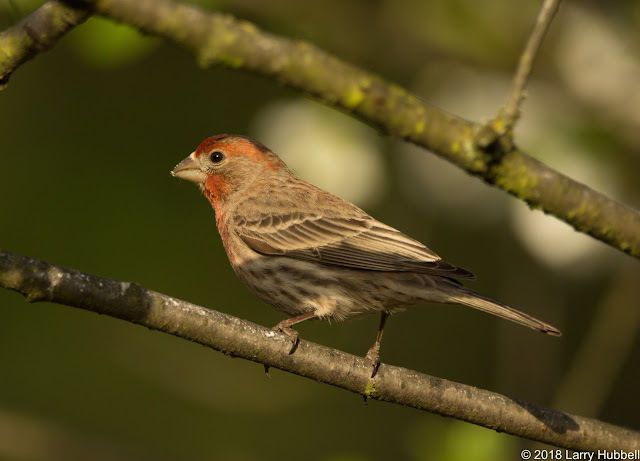 While reviewing these photos, I was impressed by the thick heavy bills of the House Finch. Clearly, their bills enable them to crush seeds, pods and buds in order to extract sustenance. 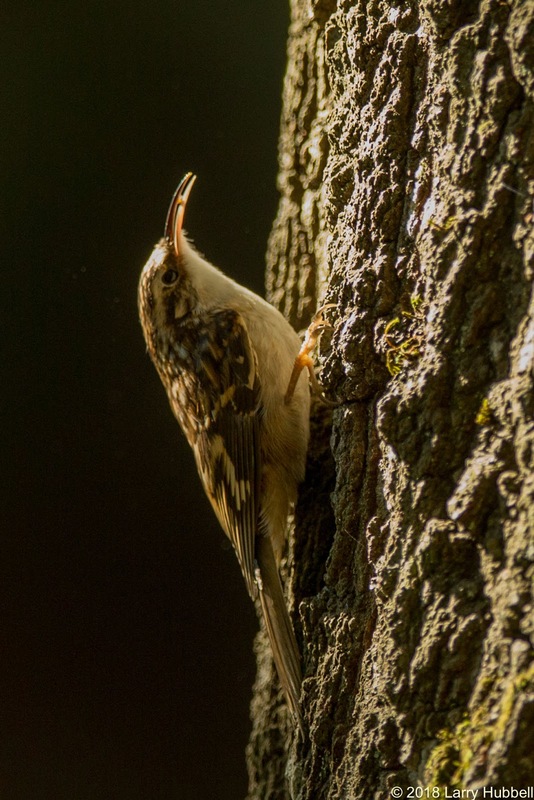 This inspired me to consider the variety of ways in which relatively small birds' bills and tongues are uniquely adapted to help them find food. Golden-crowned Kinglets have tiny, elegant little bills. 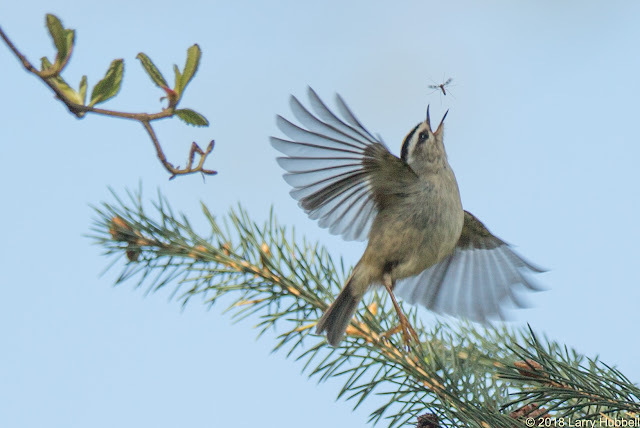 Their bills are so light-weight that they help enable the kinglets to swiftly grab insects in flight. Hummingbirds have long, thin, bills and tongues which enable them to reach deeply inside a blossom to secure the nectar. 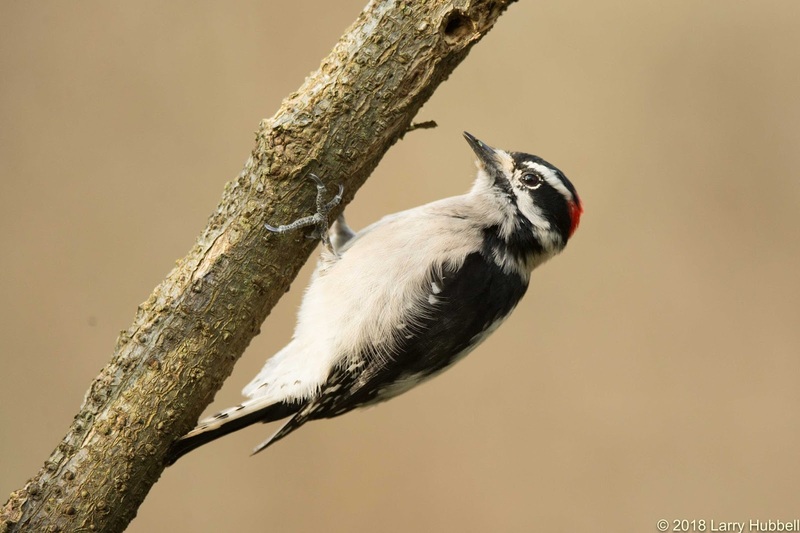 Downy Woodpeckers have short, sharp beaks with a stout base for drilling holes in woody plants and decomposing trees. They also have relatively long, barbed tongues, with which they reach in and pull out juicy little lifeforms like larva. 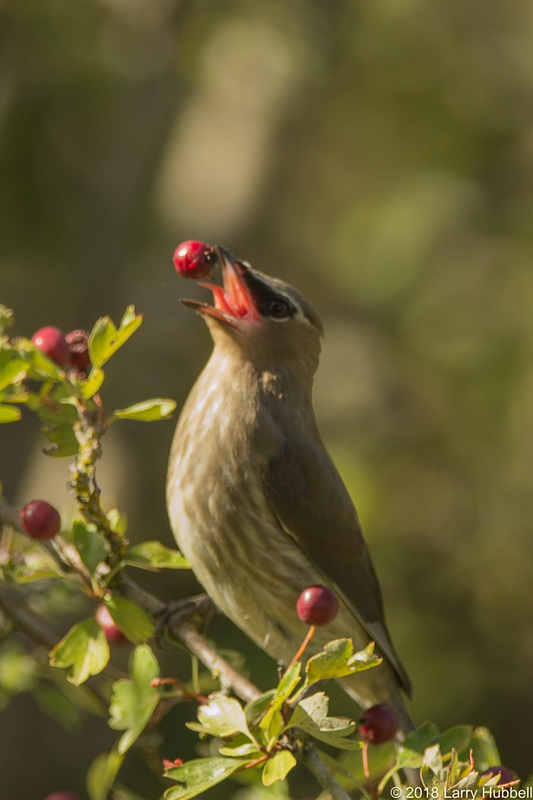 Cedar Waxwings have fairly small bills, but very wide mouths. No doubt this arrangement helps with swallowing fruit whole. In addition, their tongues have a rear-facing projection which resembles a fish hook. Actually, it may be that fish hooks resemble their tongues. Once their food passes beyond the hook, the hook can then sink into the soft fruit and pull it down into their throat. 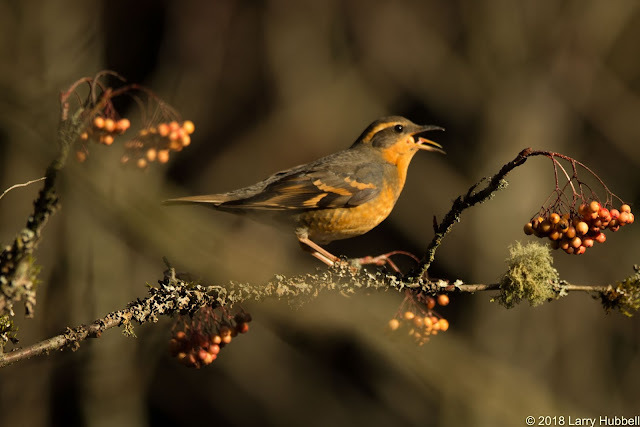 Varied Thrush have a similar tongue, although the rear-facing hook may be slightly less defined. 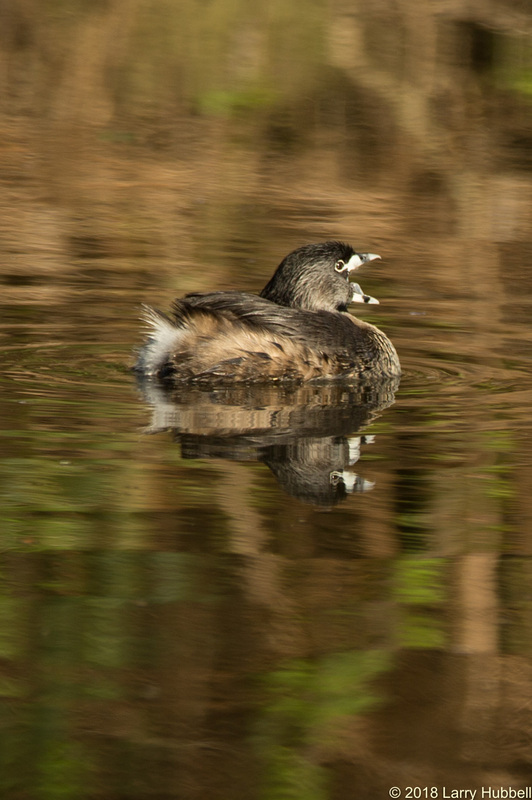 Pied-billed Grebes have surprisingly thicks bills, which help them crush and hold small slippery fish. Birds of North America says, their bills also enable them to consume crayfish, despite the hard exoskeleton. See the reference below. The reference refers to research done by my friend and mentor, Martin J. Muller. Martin has also been working on a wonderful new website called, UrbanRaptorConservancy.Org. 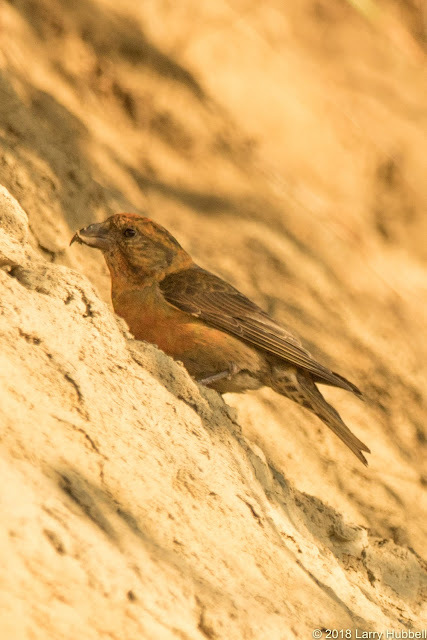 Red Crossbills have one of the most sophisticated and interesting adaptions of all. Their bills enable them to reach between the scales of a pine cone and pry it open. 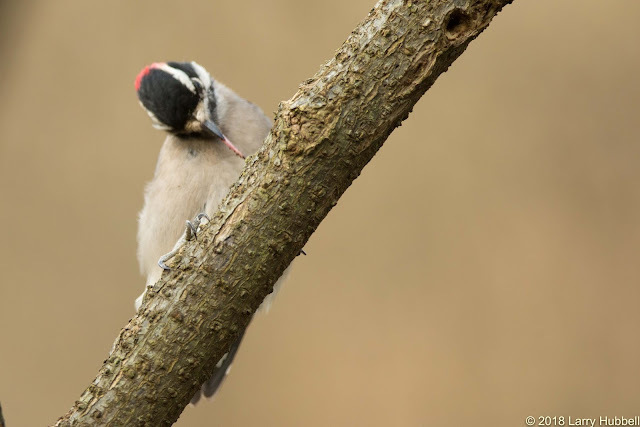 This allows access for their tongues to reach the sharply-defended pine nuts, which are quite safe from most other avian species. 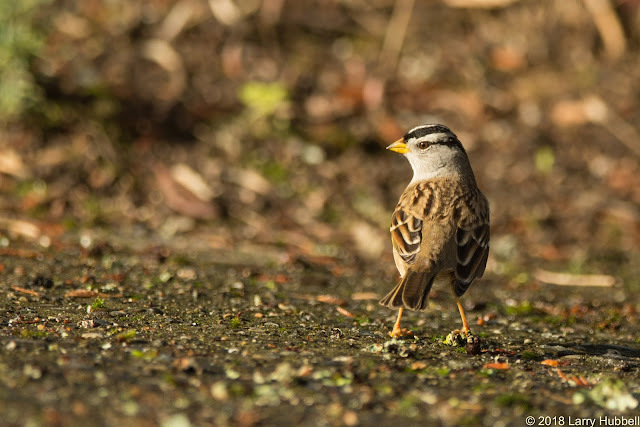 White-crowned Sparrows have bills which look like miniature versions of the House Finch bill. This enables them to eat mostly small seeds, but they occasionally supplement their diet with insects and such. 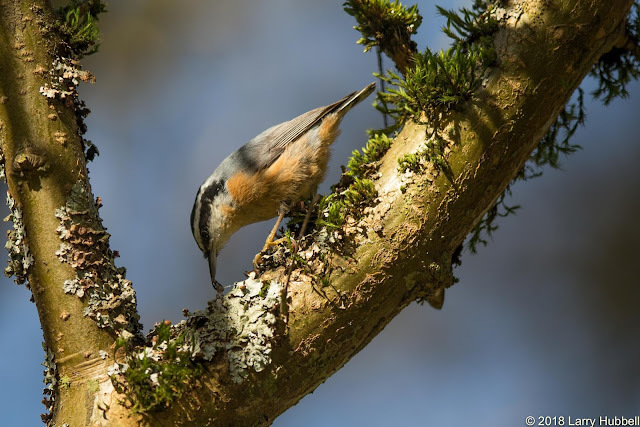 The relatively short sharp bill of the red-breasted nuthatch is like the Swiss Army Knife of bird bills. 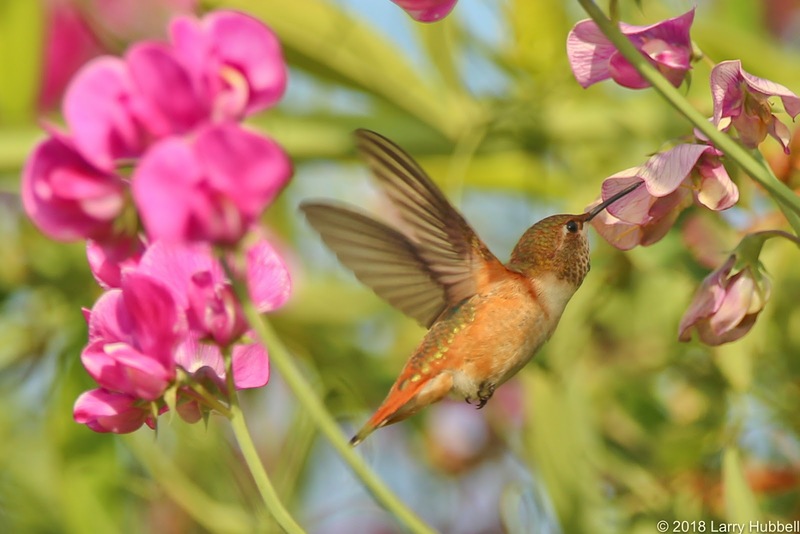 Not only do they gather and cache seeds, they also catch insects and other lifeforms as well. This photo, taken earlier in the week, fits nicely in a Mother's Day weekend post. It shows a mother returning to the nest with a nice white spider for her young. By the way, you might want to compare the eye stripes and caps of the nuthatches in these last two photos. 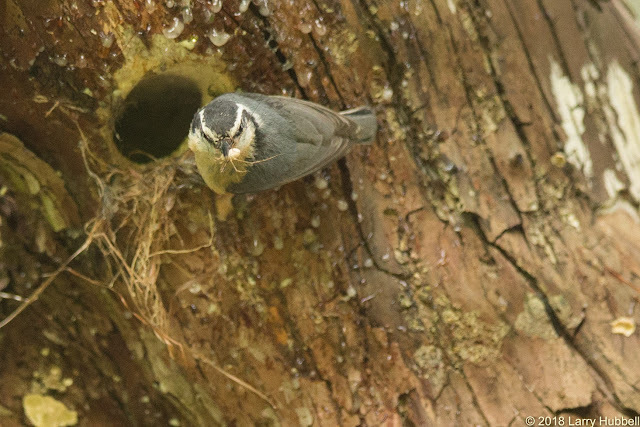 The crisply black head markings indicate a male, while the lighter gray-black coloring indicates the nuthatch is female. Brown Creepers use their slightly decurved bills to reach in and around crevices in the bark. Given that they are almost always seen searching for small living creatures on tree trunks and branches, I suspect they would not do well as vegetarians. 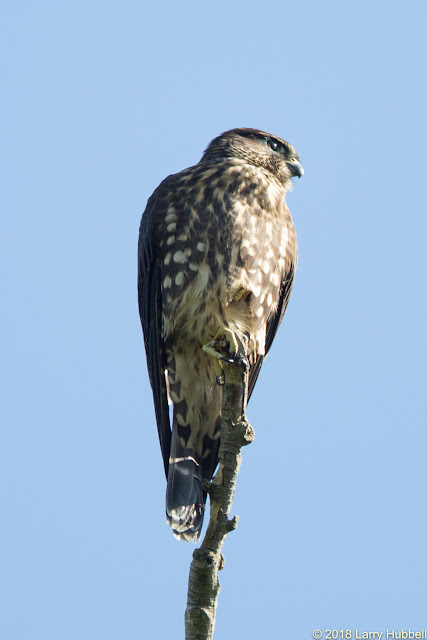 A Merlin has the the flesh-rending bill of a predator. While this is a beautiful an elegant little bird, it is clearly a carnivore. 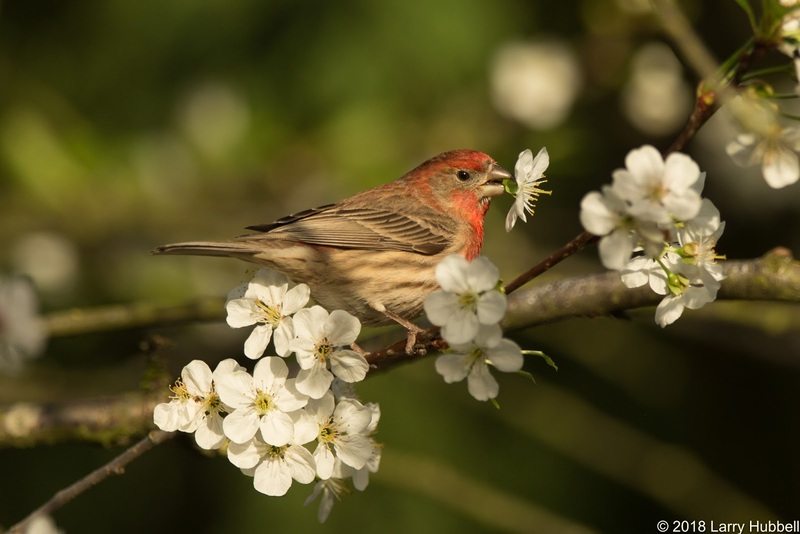 It is amazing how nature has produced so many variations in bird bills. The thousands of possibilities worldwide go far beyond these few local examples. However, in all cases, the variations in bills fit the variation in food sources. Regardless of the species, they all have one thing in common, none of them, or us, would be here without our mothers. Happy Mother's Day to one and all! 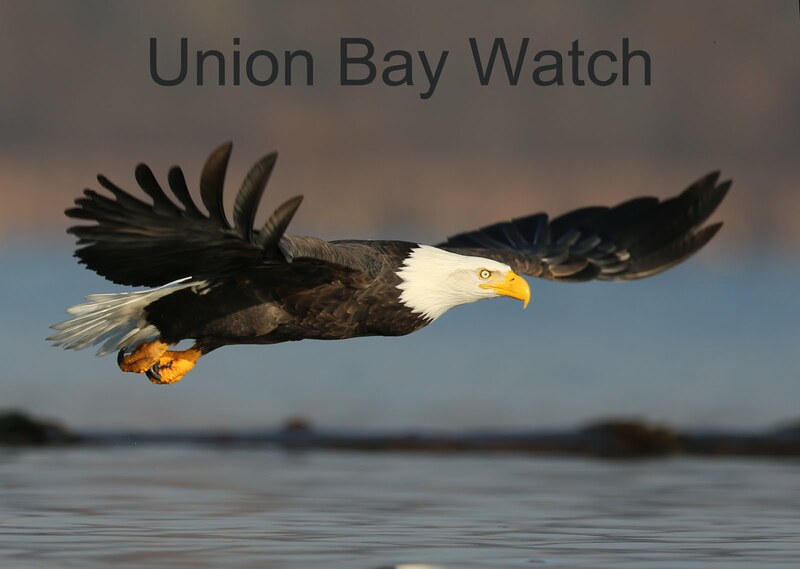 Have a great day on Union Bay...where Mother Nature survives in the city! What species of tree is this? Is it native to Union Bay? 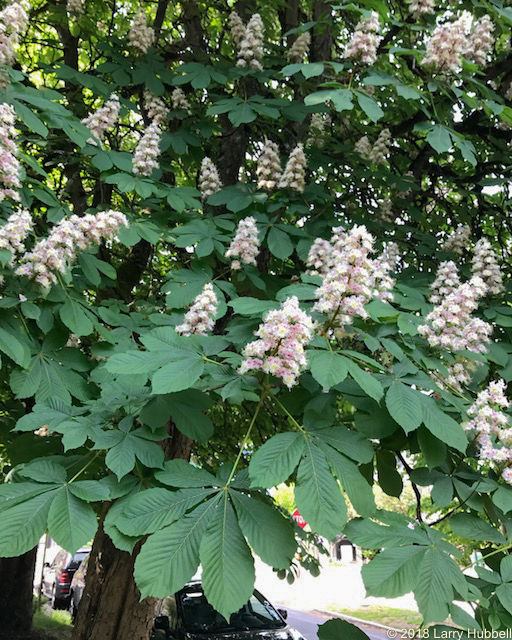 Horsechestnut: This tree is native to the southeastern portion of Europe. It thrives in our Pacific northwest habitat, however I would prefer one of our native Bigleaf Maples (BLM). The BLM has a similar size and shape and is adapted to coexist with our native flora and fauna. Love the way you combine the subject (bills) with your delightful photos! Thank you! I kind of had to reach for that one, but I was fairly happy with the way it turned out. It is very nice to hear that you enjoyed it.